These statues are among the earliest known large-scale human figures, dated to approximately 8700 - 8500 years ago. There are two groups of statues which were deposited in two different parts, with a difference of 200 years: approx. 6700 BC and 6500 BC. Excavations at the Neolithic site of Ayn Ghazal in Amman, in 1983 and 1985, uncovered over 30 human statues in two groups. The statues were found neatly aligned inside two pits that were dug on purpose, which led the excavators to conclude that they were intentionally buried rather than merely discarded. The statues were formed a skeleton of reed, covered with plaster. The bodies are flat, indicating that they were made on a flat surface. The heads are emphasised and the eyes are painted with bitumen, which was brought from the Dead Sea. Still, the exact relation between spirituality and the statues is not clear. They could have represented the ancestors because of their burial manner, which was similar to the way the human dead were buried. Alternatively they may have been mythical figures, responsible for life and fertility. 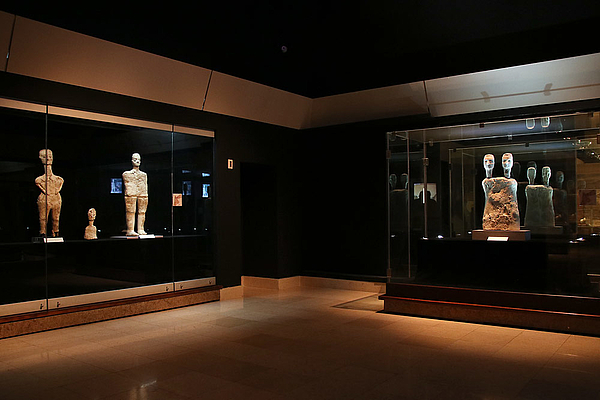 National museum of Jordan’s history and culture. Over 2,000 artifacts, incl. Ain Ghazal Statues, the earliest large-scale human representations; Nabataean exhibits; Dead Sea Scrolls.